Low trading activity & volatility in the TWD. The latest Bank for International Settlement (BIS) FX Survey shows low global trading activity in the New Taiwan Dollar – the TWD ranks 23rd among all currencies in the world. FX traders lack interest in Taiwan’s currency due to its exceptionally low day-to-day volatility and Taiwan’s low interest rates (offering no “carry trades”). USD/TWD correlates positively with USD/CNY. China is Taiwan’s most important trading partner, so anything that affects China’s economy affects the economy of Taiwan in turn. 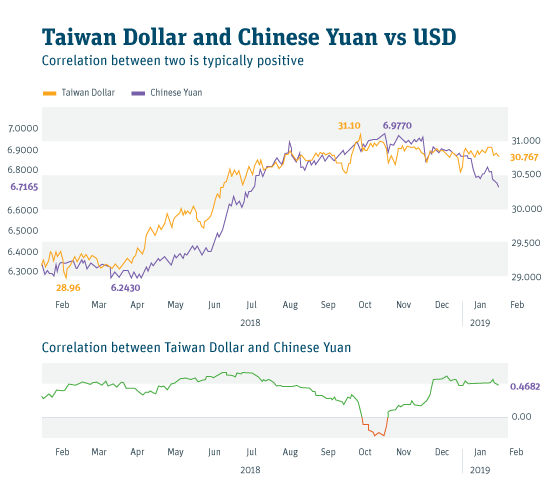 The ongoing US-China trade war is an added risk for traders in the TWD, but Taiwan’s central bank actively controls that risk by periodically intervening in the FX market. The positive correlation between movements in the TWD and the CNY helps facilitate trade by lowering currency risk for companies from both countries doing business with one another. China’s pressure on Taiwan to reunify. China’s President Xi has recently stepped up pressure on Taiwan to move towards reunification with China. At the same time, the US Navy has stepped up military operations near Taiwan in the South China Sea, where China has territorial claims. Things are definitely heating up, but traders/investors have yet to react by moving out of Taiwanese assets and the TWD. Chinese Lunar New Year fueling TWD strength. Taiwanese exporters normally pay out employee bonuses ahead of this week’s Chinese New Year, and to meet the cash-flow need, they often convert their foreign currency proceeds from export earnings, or sell USD holdings on their balance sheets, leading to buying pressure on the TWD. Expect downward pressure on the TWD in Q3. Due to annual dividend payments (denominated in TWD) by Taiwanese companies in Q3, repatriation of these dividends by foreign investors requires selling of the TWD, putting downward pressure on the TWD. Last year, the USD/CNY rose 11.8 percent from 6.2430 to 6.9770 – while at the same time the USD/TWD climbed 7.4 percent, from 28.96 to 31.10. Both currency pairs have dropped lower since then and have done so with low volatility. In the lower window, we can see that the correlation between the two currency pairs has been positive, fluctuating between 0.2 and 0.6, aside from a brief time last October. USDTWD is highly dependent on moves in the USD/CNY, and will remain so over the foreseeable future. As US-China trade talks continue, China will keep its currency stable, preventing it from breaching 7.00 (4 percent higher from where it is now). The Taiwan Dollar will also remain quiet, and 31.00 should be toppish. 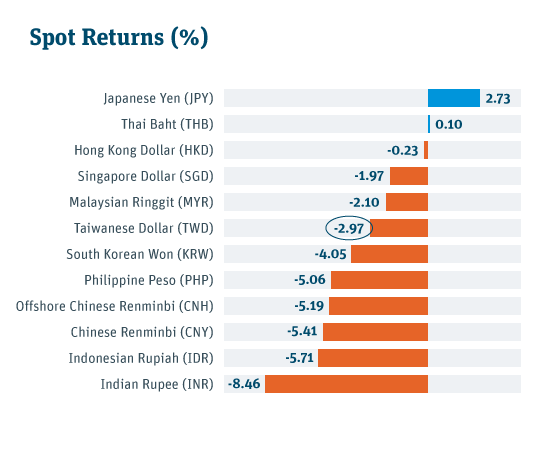 We forecast a weaker USD / stronger CNY / stronger TWD in Q2 and beyond following the negotiations. Hedging: Tactical hedging of TWD-denominated expenses (using 3-6 month NDFs) is recommended if the USDTWD climbs towards 31. Strategic hedging should be considered as our long-term (1-2 years) view for the US dollar is that it will weaken against all currencies. Read how the Chinese renminbi may move as market uncertainty rises on a global scale. For the full review of what moved markets and the look forward, read our latest FX Monthly Outlook. For analysis particular to your situation, contact your FX Advisor or email SVB's FX team at fxadvisors@svb.com.